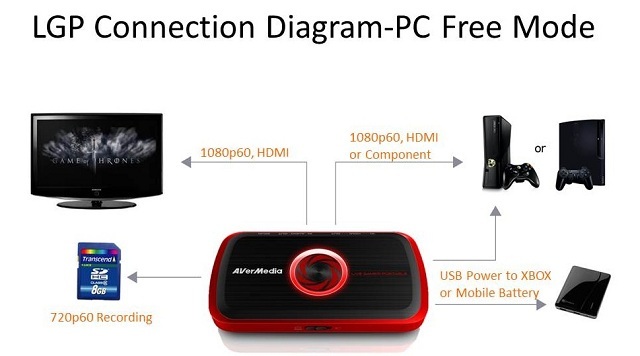 In this post I will show you how to get started with the AVerMedia Live Gamer Portable’s “PC Free” mode. The tutorial is based on my own experience of setting up the LGP with my Sony Playstation 3 but XBOX and Wii users should also find the instructions useful. Perhaps a fairly obvious requirement: you will need AVerMedia’s latest capture card. If you don’t already have one here’s the cheapest place to buy one in the UK. [& the USA]. I went for this 128 GB San Disk SD card so I could have as much storage space as possible. Admittedly, at £118 it wasn’t cheap but I was suckered in by the “extreme” branding. I see no reason why the 128 GB Secure Digital Extended SD card from Kingston Technology wouldn’t be just as effective and it’s available for £50 less. Those of you in the US of A can use this link to find deals on SD cards for the AVerMedia LGP. Sadly, this wasn’t as easy as popping the SD card into my computer and hitting format. To make the SD card work properly with the Live Gamer Portable, it needs to be in FAT32 format. To correctly format the SD card for your LGP, I suggest you download a program called GUIFORMAT [free download link]. Formatting in Windows is impossible and the method I tried in DOS (via Command Prompt) took well over an hour and then crashed at 99% stating that my SD card was too big (!). 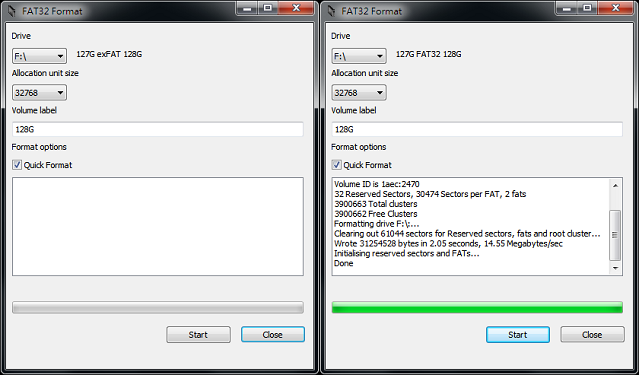 In GUIFORMAT you just have to select the drive you wish to format and then hit the start button. Even if you intend to use the Live Gamer Portable in “pc free” mode, you will need to connect to your computer to ensure the drivers are up to date. All you need to do is head on over to the official LGP product page and, from the downloads section, grab the latest application & driver. Plug your LGP into your PC using the USB cable provided and then run the installation software. Assuming everything is connected properly, the light on the front of your LGP will flash blue in a clockwise motion, until the driver update process finishes, when the light will revert to a solid blue glow. As was the case with my last capture card, AVerMedia’s Game Capture HD, the LGP comes with everything you need to get started. First, you need to hook up your LGP to your TV, which is simply a case of hooking up the HDMI (out) to the HDMI (in) on your TV using the HDMI cable provided by AVerMedia. Next, hook up your LGP to your PS3 or XBOX. If you’re on the latter, you can use the HDMI (out) on your XBOX to the HDMI (in) on your LGP. PS3 users will be using the supplied PS3>LGP cable (as pictured). Finally, hook up your LGP to a power source. If you’re using PC-free mode I’ll assume you don’t have a PC in the vicinity of your console so just connect the LGP to your PS3 or XBOX using the mini-USB to USB cable that comes in the box. Make sure ‘the’ switch (it’s the only switch… and it’s on the opposite side to the cables you hooked up in the previous step) is to the right. Once powered up your LGP will glow a steady red. Hit the glowing button and it’ll change to a throbbing red, which indicates that you are recording. Hit the button again to finish your recording. Eject the SD card from your LGP and pop it into a computer. The LGP records to a “.ts” format which can lead to problems when importing your files into Sony Vegas or other editing software. What you need to do is download AVerMedia’s .ts to .mp4 conversion tool, which is available on their LGP downloads page. The following video involves a short clip from FIFA 13, captured in PC free mode and then rendered in Sony Vegas, using the same templates that I used for my AVerMedia Game Capture HD. Whilst I might tweak these at a later date I am quite happy to continue using them for the time being. The quality test features some live MW3 gameplay, rendered in Sony Vegas without any colour corrections. I will be carrying out subsequent tests on Black Ops 2, FIFA 13 and a few other games in the near future and, when I get a chance, will try to knock up some colour correction packs. If you don’t want to miss these, make sure you subscribe to my YouTube channel. AVerMedia Live Gamer Portable (C875): best HD capture card of 2013? Sadly not…. the LGP records in some bizarre format which doesn’t really sit well with Sony Vegas. It will load the clip but I found my system crashed quite a lot unless I converted to MP4 using http://www.dvdvideosoft.com/ – it’s completely free and takes around 5 minutes to convert a 10 minute video. My pc free files all show as zero capacity, my sd card is formatted to fat32, any ideas? What’s your exact set-up? Which system? Which wires are you using? I’ve got hdmi from my 360 to the LGP, then hdmi to my TV. I’m using a 64gb sdhc formatted to fat32 as advised by all. After I’ve stopped the recording in free mode I’m removing the card and a file shows, but the file size is zero, the very 1st recording I did worked but nothing since which is odd. In PC mode my capture also freezes regardless of the bitrate or framrate. Open to any suggestions as Avermedia has next to no documentation or help forum. If PC free & PC mode are both giving problems it sounds like you’re not getting any “in” feed or even have a faulty unit. Have you made sure your XBOX is going to the HDMI in slot? I know it sounds like a silly question!! Sounds like a loose connection! I’m facing the same problem. Did someone get the solution to this problem? I use a Class 10 128 GB SDXC card, I have tried with two different cards with the same capacity, but it’s the same problem. When I try with a Class 4 32 GB SDHC card, I have not this problem, but I can’t record in 1080p with a Class 4 card. I tried to record gameplay on my Xbox 360 with this…it never records the audio. What do I do? Have you set your sound to output correctly from the XBOX menu? Working great, thanks for the tutorial! My only problem now is working out how to get the mic audio to appear in the recorded video? I can get the XBox Audio fine, but can’t get the microphone audio. Any ideas please? Are you using XBOX chat to record audio, or something else like Skype? Hi Adam, using a headset plugged into the XBox controller and then signed into XBox Live. Not using Skype, just the standard XBox party when in games. Where abouts in the menus would I find that? Sorry to be a pain! I’m on PS3/PS4 so I couldn’t tell you to be exact. Someone else in the comments had the same problem and fixed it – check the sound or advanced settings. I have a Wii and a Wii U. Is there a way of recording live commentary in PC-Free Mode? Do they have HDMI connections? If so, yes. If not, you may need a converter … or just use the AVerMedia Game Capture HD / HD II which is Wii compatible. Ok. They do. Now since I am evidently being slow and missing something – what do I use the HDMI ports for and how? So you should have Wii to LGP via HDMI, then LGP to TV via HDMI. That will capture visuals & game audio. What is it that you are missing? I want to be able to record myself speaking as well. I know you can do that when hooked up to a computer, I want to know if there is a way to record yourself when the LGP is not connected to a computer. Are you speaking into a headset and, if so, is the headset hooked up to the Wii via an optical cable? Yes, I am using a headset. Or I want to. I am just not sure how to use it with the LGP. I don’t know much about using headsets with a Wii. But if it’s like PS4/XBOX then you’ll need to set the sound to output via HDMI *and* Optical if you want the LGP to record your commentary. Hi, struggling to get this to work on a PS4 in PC free mode – we get game sound but not audio. We have a Turtle Beach PX4 headset, can we record via it and if so where do we plug in? Sound settings are Optical for game sound and Headset for chat. Thanks. Hi, problem is with sound – ie do we record sound via the headset, if so where does it plug in and which PS4 settings are used? Currently we just have HDMI in and out of the LPG and it records the game sound fine. Thanks for the time to answer, we are frantic! What system are you playing on? I have followed the steps but I still have a red light that just stays there and if I press it then it will flash red and blue. Please help! Are you using PS4 by any chance? no PS3 really don’t know what to do! What are you connecting to what? It sounds like you may need to alter your output settings… or check the SD card is formatted correctly…. what format do I use for the SD card? hey would you have Skype? Do I need to put the SD card in while the Avermedia is on? hope you can help! Yep. Have you set your sound to output via the optical cable AND the audio cable in the XBL menus? a. Record my voice and the screen and upload this onto You Tube. There’s no problem doing this. b. In X- Box Live Party mode we can record friends’ voices and the game on our TV and upload that onto You Tube. However, we can’t have my voice and my friends’ voices at the same time. For example, when we did a recording and uploaded it, we could hear friends’ voices, but my voice couldn’t be heard. Or we have my voice and not my friends’ voices. It’s either one or the other. Fantastic ideas . Speaking of which , if people is looking for a service to merge some PDF files , my wife used a tool here http://goo.gl/zzDrj8.